Combining the strength and flexibility of steel with the corrosion resistance of glass, Fusion Tanks & Silos is quickly becoming the choice of engineers and industrial professionals worldwide. Fabricated utilizing the innovative glass-fused-to-steel technique, these defect-resistant storage vessels are designed to provide decades of trouble free service in harsh environments. Their low maintenance demands and natural resistance to contamination make them ideal for the containment of potable, municipal, agricultural and industrial fluids. Boasting ISO 9001 certification and more than 16 standard inspections for its units, Fusion Tanks & Silos provides the absolute highest quality glass fused steel tanks available on the market today. Call American Tank Company today for more information on glass-fused-to-steel storage solutions. 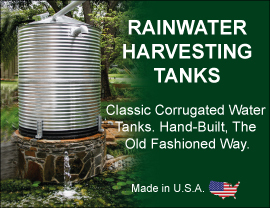 Professional engineers first choice for a municipal water storage tank and commercial / industrial storage tank applications. Call toll free today: 1-800-655-9100 to speak to one of our friendly and knowledgeable Galvanized Municipal Tank Specialists.